On 8th Feburary, the Guangzhou City Government announces that West 8’s entry has won the Guangzhou Fangcun Huadi Sustainable Master Plan competition. Guangzhou Huadi Fangcun (Flower City), located at Southern China, is a former delta land with traditional horticultural legacy of nowadays Guangzhou. With speedy expansion of the horticultural industry, the current scattered and disorganized land use of the area has pushed back the nature and its eco system is severely polluted. The Guangzhou Government is in search of a sustainable solution to the current problem in the era of rapid urban development. West 8’s winning entry provides the city a masterplan with sustainable vision. The plan has the site area of 2,050 ha. (20.5km2), whereas more than 450 ha. is wetlands area. 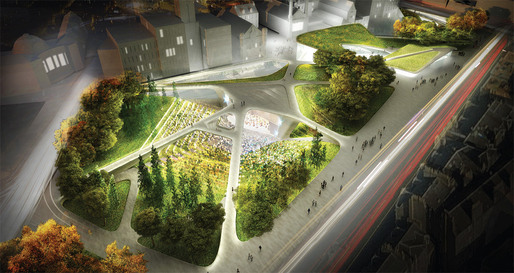 It consists of new living and industrial environments with ecological water system, wetlands, distinct division of land use zoning, urban planning with a highlight of cultural heritage and a design of an International Flora Expo Masterplan which will function as a focal point and economic generator for the whole development. New ways to see what a bridge can be , in the city of canals, where bridges are part of every day life, in many ways the bridge wether over water or land is an integral part of how we envisage and experience cites- from the heaviness and separation we experience under traditional freeway fly-overs to the feeling of lightness on a steel suspension pedestrian bridge over water- from bustler my own preference is for the 3rd prize from London with its flexibility and references to its historical and future context. Three outstanding bridge designs have recently been selected as winners in theAmsterdam Iconic Pedestrian Bridge competition. Hosted by [AC-CA], this open international competition called for proposals that would reflect contemporary design tendencies and also take into consideration the “urban insertion and impact geared towards creating a new architectural symbol for an European capital city.” The program for the 90m long pedestrian bridge also included a 100 m2-cafe, a 50 m2-bicycle repair space, restrooms, facility rooms, as well as 30 bicycle racks. From the jury report: “The winning project was able to combine an iconic proposal with a real urban solution. A circuit bringing us to the heights or depths, a partially submerged Ring on an extraordinary equilibrium. It swims and at the same time threatens to fly. It is a solution that engages the user to ponder on the decision of which path to choose: the underwater for a romantic and exploring passage or aerial for a bright and direct path – Ring of pedestrian and environmental activity. At the moment, there are however no plans for this Iconic Pedestrian Bridge to be actually built. From the jury report: “This is a very poetic and minimalist proposal, which in itself could be iconic for that very reason. The drama created by the scene of people walking over the canal elevated this project, reminiscence of the “Moses Bridge”, however a different kind of proposition. The floating principle of the bridge allows for very low impact, with a very high urban effect. From the jury report: “This project was executed cleverly with light-hearted humor and a rather risky approach. The Jury could not help but appreciated such a fresh and simple proposition capturing all the elements with an undertone of good and responsible citizenship. The proposal is a rather organic and flexible bridge that grows and shrinks with time, need, weather or specific event. It is the activity over the water that creates the passage – a slow-living organic passage. The bridge lives and exists, thanks to the way the users approach and use the space, through the identity or activity that is going on around it. This is not just a bridge but, in itself, constitutes a neighbourhood, a place or space constantly changing to meet the needs of daily life in the city. From Archinect a multilevel interconnected web surface is created as a structural response to the multiplicity and heterogenous needs of a dense urban area brings an integral thickened surface – Stan Allen’s ‘Mat Urbanism: The Thick 2-D” With a now familiar idea diagram from a rubber band the design displays D&S’s out of the box thinking. ‘This is such an exciting outcome and a great coup for the city. This ingenious and inspiring design for Aberdeen’s key public space gives the city a new social landscape but one rooted in its extraordinarily rich heritage and natural assets. Check the Bustler article to also see the projects of the five shortlisted teams led by Foster + Partners, Gustafson Porter, Mecanoo, Snøhetta & Hoskins, and West 8. In the competition for the Olympic Port in Rio de Janeiro, Brazil, the winning entries have been announced. Sponsored by the City Government through the Instituto Pereira Passos, organized by the Rio de Janeiro chapter of the Institute of Architects of Brazil, and supported by the Organizing Committee for the 2016 Olympic Games, the competition aims to rebuild the old harbor area of ​​Rio and thus be an important agent of this long-awaited process of urban renewal for the city and the entire region.